The torque converter is a critical component of any vehicle. It basically serves to important functions. First, it is what manages the amount of fluid that gets transferred to the automatic transmission system. Second, it keeps your engine running when you bring the vehicle to a stop. In other words, the torque from the rotating components of the engine is transmitted to the automatic transmission system. This is how the automatic transmission can switch gears properly based on the demands of the engine. The torque converter is conveniently positioned in the middle of the transmission and internal combustion engine. The converter is attached to a flex plate in this area. When you start the engine, the motion of the crankshaft will spin the flex plate. All the engine torque energy generated gets converted into torque energy for the transmission. Obviously, if the torque converter were to malfunction and go bad, it would not be good for the transmission of the engine. Drivers don’t normally recognize when their torque converter goes bad. They will confuse the symptoms for a problem with the transmission since they’re very similar. In any case, this is a problem that should be investigated at once. In fact, a transmission probably would be even worse than a torque converter problem. So, for your sake, let’s hope it is only a torque converter problem because that is a cheaper component to replace. 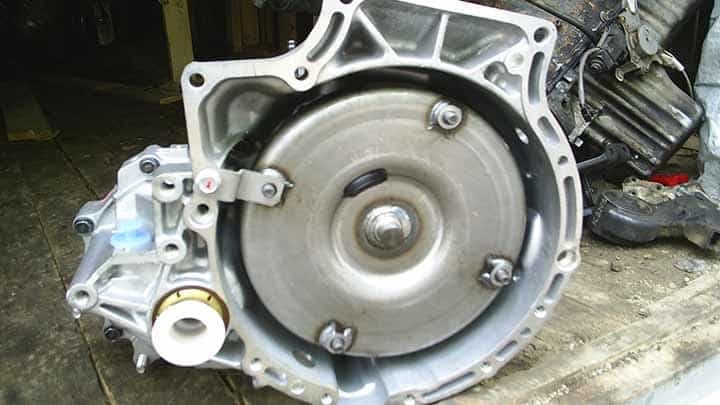 To better tell the difference between a torque converter problem and a transmission problem, below are the top 5 symptoms of a bad torque converter in your car. Let this guide you toward self-diagnosing the problem. 1) Difficulty Shifting – The output pressure of your torque converter will be reduced if the converter malfunctions. Without this output pressure, you’ll have delayed shifts which don’t respond in time. The shifting may feel soft at first but then, it will become tougher the longer it goes unfixed. This will, in turn, raise the RPM and put more stress and demand on your engine. Then you can expect your gas mileage to be reduced in the process. 2) Rattling Sounds – There will be a lot of rattling sounds coming from your torque converter if it goes bad. These sounds will grow louder and more annoying as you accelerate the vehicle faster. This will be the most apparent when you go from a stopped position to a drive position. The rattling sounds may even turn into whining sounds too. 3) Vibrations and Shakiness – If you accelerate your vehicle past 40 mph and experience a lot of shakiness and vibrations in the cabin, then you probably have a bad torque converter. It will feel as if you’re driving on a gravel or bumpy road. You cannot let this problem carry on for too much longer because it could lead to even bigger problems with your transmission or engine. 4) Speed Fluctuation – If you’re driving on a flat, even road and your vehicle accelerates or decelerates on its own, then you could have inconsistent output pressure coming from your torque converter. This will make it even more difficult to drive when the weather conditions are rough outside. 5) Slippery Transmission Gears – The transmission needs to receive the proper amount of transmission fluid in order to function properly. But if your torque converter goes bad, then your transmission won’t receive the proper amount of fluid. After all, the torque converter is the component in charge of managing the flow of transmission fluid. If it doesn’t do its job adequately, then the transmission’s gears will slip. Not only will this ruin your fuel economy, but it will make it more difficult to accelerate too.